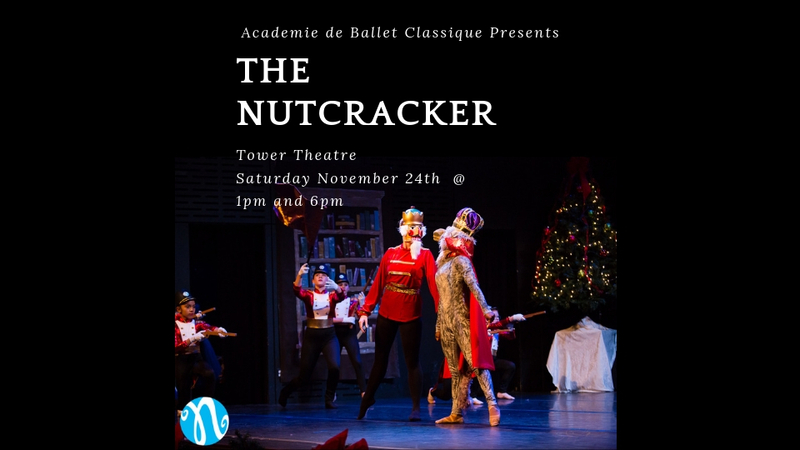 Academie de Ballet presents The Nutcracker Ballet. The Stahlbaum’s prepare their home for their Christmas celebration. Families arrive with gifts and the celebrations begin with dancing. Drosselmeyer arrives to surprise his goddaughter, Clara. She receives a special gift, a beautiful nutcracker doll. After the party, Clara falls asleep dreaming of her Nutcracker doll, who turns into a Cavalier Prince. He introduces her to the Queen of the Kingdom of Sweets and the Sugar Plum Fairy. Clara watches soldier dolls fight mice. Snowflakes flurry about as she travels to the land of many sweets. We hope you enjoy this timeless magical tale. Two performances: 1:00 p.m. and 6:00 p.m.